Now the calculator is set to assume 1 period/year. To confirm this setting, press and hold [Gold Shift] [C ALL]. Unless needed for other work, we generally leave the calculator setting at 1 period per year. To set this back to default value, press 1 2 [Gold shift] [P/YR]. Note: To verify that this is set correctly, press [Gold Shift] [C ALL], the calculator will display "12 P_Yr" for about 2 seconds. Tagged By: hp 10bII+ Plus Self Test, hp 10bii - A home mortgage problem, hp 10bII - Tutorial Ordinary Annuities, hp 10bII - Tutorial Varying Cash Flows, HP10BII Calculation Example 1, HP10BII Calculation Example 2, HP10BII Calculation Example 3, HP10BII Calculation Example 4, HP10BII Calculation Example 5, Getting Started. Thank you so so much. 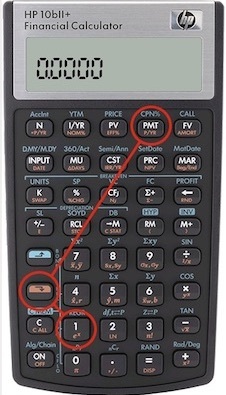 I was so angry and frustrated at my calculator, why would the manufacturers do something so stupid? Thanks heaps for these instructions. Thanks a lot guys for this help. Yhoo!! I almost sold my calculator thinking it&apos;s faulty. Sorry for the error on the diagram. It has been replaced with the corrected diagram. Thank you for your feedback.